Finally finished up my fishing rod rack and it turned out great! Made it out of oak at 3/4 inch. Was a lot easier than I thought and din’t give me to many problems. Used dado cuts on all the shelves and used dovetails for building the drawers. The drawers ended up working very well without any mechanism for sliding. I used an english chesnut stain with a semi gloss finish. Two light coats and it turned out great. Let me know what you think! I like that! I think I have like 50 or so rods and could probably use several of these! Of course, then I would have to display them and drive the wife crazy! Anyway, it looks very well done!!!!!!! Looks freaking great, bro! Yeah Yeah yeah! looks like it will have a great new home in your basement. I really like the handles you chose for the drawers too. 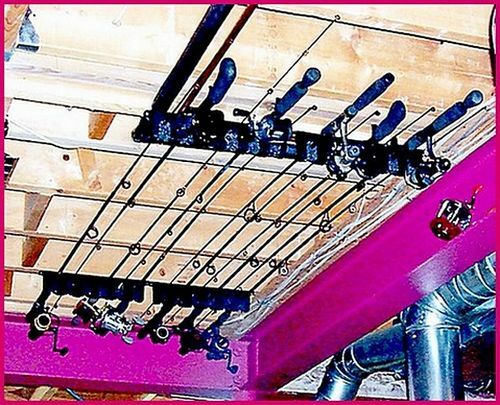 That is a nice looking rod rack. Just needs rod in it now. Very Nice Indeed! Thank For Posting! Very nice! I really like the design. Thanks for posting! almost up to a Daily Top 3… not too shabby for a 17 yr old! let’s see if you can earn that badge! Looks great! I need to make myself one of these! I too am ready to see this get the badge! thanks to everyone for the comments. Ended up making top 3! Congrats on making the Top Three. You deserve it! That is a mighty fine piece of work young man. Good design and workmanship. The Dove tails looks good and adds character; I like the absences of drawer slides when the drawer operates smoothly. Drawer slides on Fine Furniture are slim and none. You did a great job, congratulations. Nice looking rack. You need more rods, though.